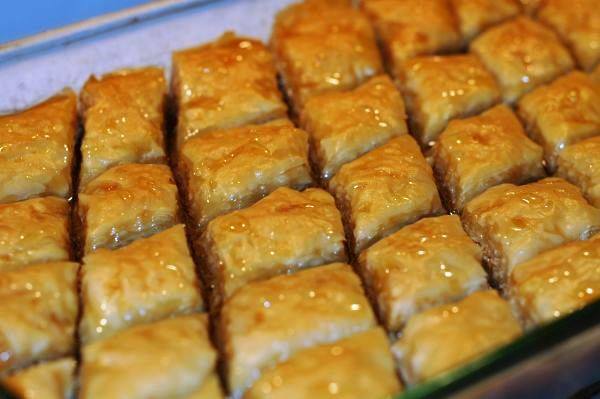 Baklava is a Turkish dessert delicacy, being one of the best known of the cakes. It is considered the national cake in Greece, Turkey, Bulgaria, but is found in all the kitchens in the Balkans, the Middle East and the Maghreb countries, being equally and a dessert of Cypriots and Armenians of the Afghans. Scotem sheets of cold pie, le lasăm a few minutes at room temperature and in the meantime, put the butter to melt over low heat. Mix ground nuts with 500 g of sugar, a pinch of salt, vanilla sugar, 4-5 tbsp water and lemon rind. Mix well until it forms a paste that you lasăm a few minutes to act. Prepare a tray on which a brush with a little butter, give way to the oven to 120 ° c.
Put the first sheet, brush with melted butter, put the second sheet, brush with melted butter and a third sheet to sort, and then put the Coconut cream and cover with the remaining three sheets, which they in turn spread with butter, cut pieces and give them suitable. While staying in the oven, prepare the syrup from 500 g sugar, 250 ml water, vanilla and lemon rind and orange. After you have plăcintuţele baking tray, remove and pour warm syrup. Lasăm about an hour to însiropeze, and we can serve.